Pressing the key before the file has been playing for 1 seconds will start the previous file. 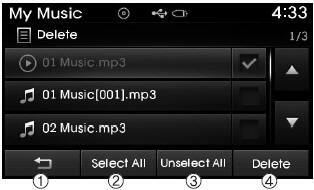 Within this mode, you will have access to the Info, Random(Shuffle), Repeat, Delete and List features. 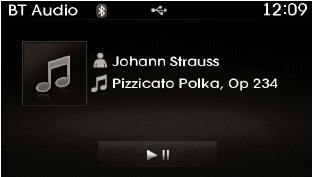 The title, artist and album info are displayed only when such information is recorded within the MP3 file ID3 tag. Press the button to play files in random order. Press the button again to turn the Random feature off. Press the button to repeat the current song. Press the button again to turn the repeat feature off. Press the button to delete the current file. Bluetooth® Wireless Technology Audio Mode can be used only when a Bluetooth® Wireless Technology phone has been connected. Bluetooth® Wireless Technology Audio Mode will not be available when connecting mobile phones that do not support this feature. While Bluetooth® Wireless Technology Audio is playing, if the Bluetooth® Wireless Technology phone is connected, then the music will also stop. Moving the Track up/down while playing Bluetooth® Wireless Technology audio mode may result in pop noises in some mobile phones. Bluetooth® Wireless Technology streaming audio may not be supported in some mobile phones. 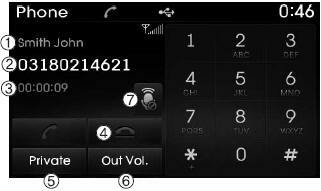 When returning to Bluetooth® Wireless Technology Audio mode after ending a call, the mode may not automatically restart in some mobile phones. Receiving an incoming call or making an outgoing call while playing Bluetooth® Wireless Technology Audio may result in audio interference. Once a Bluetooth® Wireless Technology device is connected, the mode will automatically start. The play/pause feature may operate differently depending on the mobile phone. If a Bluetooth® Wireless Technology device has not been connected, press the key [Phone] button to display the Bluetooth® Wireless Technology connection screen. 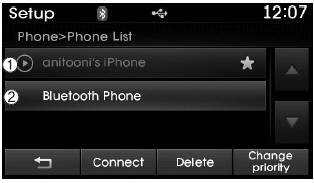 It is possible to use the pair phone, connect/disconnect and delete features from your Bluetooth® Wireless Technology phone. If music is not yet playing from your mobile device after converting to Bluetooth® Wireless Technology Audio mode, pressing the play button once may start playing the mode. Check to see that music is playing from the Bluetooth® Wireless Technology device after converting to Bluetooth® Wireless Technology Audio Mode. What is Bluetooth® Wireless Technology Pairing? Pairing refers to the process of synchronizing your Bluetooth® Wireless Technology phone or device with the car audio system for connection. Pairing is necessary to connect and use the Bluetooth® Wireless Technology feature. 1. Press the key or the key on the steering remote controller. The following screen is displayed. 2. Press the button to enter the Pair Phone screen. 3. From your Bluetooth® Wireless Technology device (i.e. Mobile Phone), search and select your car audio system. Up to five Bluetooth® Wireless Technology devices can be paired to the Car Handsfree system. Only one Bluetooth® Wireless Technology device can be connected at a time. Other devices cannot be paired while a Bluetooth® Wireless Technology device is connected. Only Bluetooth® Wireless Technology Handsfree and Bluetooth audio related features are supported. Normal operations are possible only within devices that support Handsfree or audio features, such as a Bluetooth® Wireless Technology mobile phone or a Bluetooth audio device. If a connected Bluetooth® Wireless Technology device becomes disconnected due to being out of communication range, turning the device OFF, or a Bluetooth® Wireless Technology communication error, corresponding Bluetooth® Wireless Technology devices are automatically searched and connected. If the system becomes unstable due to communication errors between the car Handsfree and the Bluetooth® Wireless Technology device, reset the Bluetooth® Wireless Technology and try again. Upon resetting Bluetooth® Wireless Technology, the system is restored to its factory release state. After Pairing is complete, a contacts download request is sent once to the mobile phone. As some mobile phones may require confirmation upon receiving a download request, check the mobile phone screen. From the paired phone list, select the device you want to connect and press the button. It is possible to pair up to five Bluetooth® Wireless Technology devices with the car audio system. The "Change Priority" feature is used to set the connection priority of paired phones. From the paired phone list, select the phone you want to switch to the highest priority, then press the button from the Menu. The selected device will be changed to the highest priority. Priority icon will be displayed when a priority phone has been set. From the paired phone list, select the currently connected device and press the button. From the paired phone list, select the device you want to delete and press the button. When deleting the currently connected device, the device will automatically be disconnected to proceed with the deleting process. If a paired Bluetooth® Wireless Technology device is deleted, the device’s call history and contacts data will also be deleted. 5) Setup : Displays Phone related settings. If you press the [Call History] button but there is no call history data, a prompt is displayed which asks to download call history data. If you press the [Contacts] button but there is no contacts data stored, a prompt is displayed which asks to download contacts data. 2) To add favorite : Downloaded contacts be saved as favorite. To save Favorite, contacts should be downloaded. Contact saved in Favorites will not be automatically updated if the contact has been updated in the phone. To update Favorites, delete the Favorite and create a new Favorite. A list of incoming, outgoing and missed calls is displayed. Press the button to download the call history. Call history may not be saved in the call history list in some mobile phones. 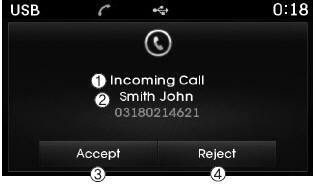 Calls received with hidden caller ID will not be saved in the call history list. Calling through the call history is not possible when there is no call history stored or a Bluetooth® Wireless Technology phone is not connected. Up to 20 received, dialed and missed calls are stored in Call History. Time of received/dialed calls and call time information are not saved. The list of saved phone book entries is displayed. Press the button to download the call history. 2) Sort by : Find a contact in an alphabetical order. 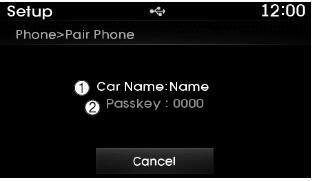 Up to 1,000 contacts saved in your Bluetooth® Wireless Technology phone can be downloaded into the car contacts. 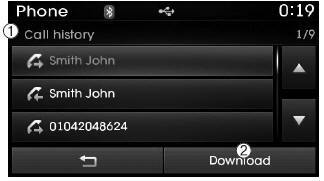 Contacts that have been downloaded to the car cannot be edited or deleted on the phone. 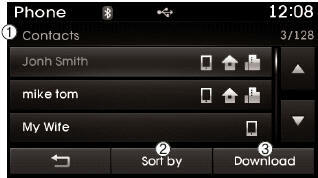 It is possible to download contacts even during Bluetooth streaming audio. When downloading contacts, the icon will be displayed within the status bar. It is not possible to commence download when the contacts download feature has been turned off within the Bluetooth® Wireless Technology device. In addition, some devices may require device authorization upon attempting to download contacts. If downloading does not normally occur, check the Bluetooth®Wireless Technology device settings or the screen state. The download feature may not be supported in some mobile phones. Check to see that the Bluetooth® Wireless Technology device supports the download feature. 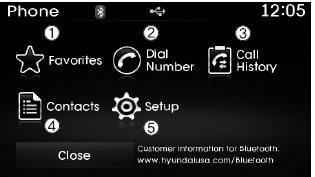 For more information of supported Bluetooth® Wireless Technology devices and function support, visit www.hyundaiusa.com. The Bluetooth® word mark and logos are registered trademarks owned by Bluetooth SIG, Inc. and any use of such marks is under license. Other trademarks and trade names are those of their respective owners. A Bluetooth® enabled cell phone is required to use Bluetooth® wireless technology. Driving while distracted can result in a loss of vehicle control that may lead to an accident, severe personal injury, and death.The driver’s primary responsibility is in the safe and legal operation of a vehicle, and use of any handheld devices, other equipment, or vehicle systems which take the driver’s eyes, attention and focus away from the safe operation of a vehicle or which are not permissible by law should never be used during operation of the vehicle. Bluetooth® Wireless Technology devices can be paired with the audio system. For more information, refer to the “Pairing through Phone Setup” section within Bluetooth® Wireless Technology. 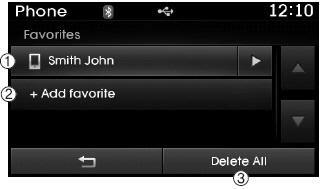 This feature is used to view mobile phones that have been paired with the audio system. Upon selecting a paired phone, the setup menu is displayed. For more information, refer to the “Setting Bluetooth® Wireless Technology Connection” section within Bluetooth® Wireless Technology. To learn more about whether your mobile phone supports contacts downloads, refer to your mobile phone user’s manual. The contacts for only the connected phone can be downloaded. As the contacts are downloaded from the mobile phone, a download progress bar is displayed. Upon downloading phone contacts, the previous corresponding data is deleted. This feature may not be supported in some mobile phones. Voice Recognition may not operate while contacts are being downloaded. When Streaming Audio is turned on, you can play music files saved in your Bluetooth® Wireless Technology device through the audio system. Use the , buttons to adjust the outgoing volume level. 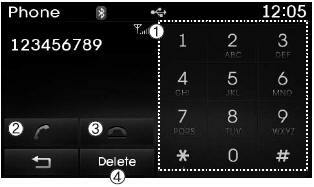 While on a call, the volume can be changed by using the key. Once Bluetooth® Wireless Technology is turned off, Bluetooth® Wireless Technology related features will not be supported within the audio system. 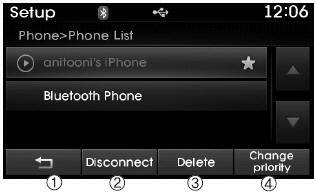 This feature is used to automatically download mobile contacts entries once a Bluetooth® Wireless Technology phone is connected. The Auto Download feature will download mobile contacts entries every time the phone is connected. The download time may differ depending on the number of saved contacts entries and the communication state. Before downloading contacts, first check to see that your mobile phone supports the contacts download feature. To turn Bluetooth® Wireless Technology back on, go to [Phone] and press “Yes”.